On Saturday it was my brother Ben's 29th birthday. We invited him and his wife over for dinner on Sunday to celebrate. One of Ben's most favorite things from home in Australia was milk chocolate mousse. We never had it homemade but over there you could buy it in the box, similar to a cake mix, mix it with some water and you were good to go. Ben absolutely loved it and I remember him often buying it, making it and eating it all alone, often in one sitting. Wanting to make Ben's birthday dinner special I set out to find the perfect recipe that would satisfy his chocolate mousse sweet tooth. I looked at many recipes, most of which involved raw egg. For some reason this just didn't sit well with me. Finally, I found it. This recipe was the winner. It was the perfect mousse consistency and it was utterly delicious. It was easy to make and the directions easy to follow. It is incredibly rich, so for me, someone who likes sweet, but not too sweet, next time I decided I would try a combination of the milk chocolate with perhaps some semi-sweet to see if I can't cut some of the richness down a tad. This recipe is a must try and won't disappoint. I promise =) Enjoy!! Milk Chocolate Mousse serves about 4 people. It doesn't appear to be a large serving, but with as rich as it is I found the amount to be perfect. Ingredients: 8 ounces high-quality milk chocolate, chopped- I used Lindt milk chocolate 2 tablespoons unsalted butter 2 tablespoons water 2 large egg yolks 1 tablespoons sugar 2 tablespoons water 2 cups of whipped cream- divided 1 tablespoon powdered sugar Directions: Combine chocolate, water and butter in a microwave safe bowl. Microwave on medium heat for 30 seconds, stir, then microwave for 30 seconds again. Stir constantly until all chocolate is melted and the mixture is smooth. Set aside to cool for 10 minutes. While the chocolate is cooling, take your whipping cream out of the fridge and place into the bowl of your electric mixer. Beat on medium-high speed until completely whipped and thick. Set the bowl in the fridge. Add egg yolks, sugar and remaining water to a saucepan over medium heat. Whisk constantly until sugar is dissolved, mixture is opaque and light yellow and has thickened and can coat the back of a spoon. Remove from heat and stir in melted chocolate mixture. Place saucepan in a bowl of ice water and whisk constantly until chocolate is cooled. Remove whipped cream from the fridge and fold in one cup of the cream into the chocolate mixture. Once whipped cream is completely folded in, evenly pour mousse into either two or four glasses. Refrigerate for 4 hours. 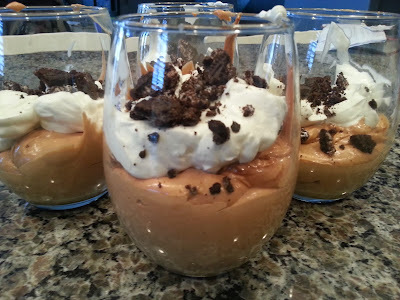 Top mousse with the additional cup of whipped cream and chocolate shavings or crushed oreos if desired. What to say about this recipe? 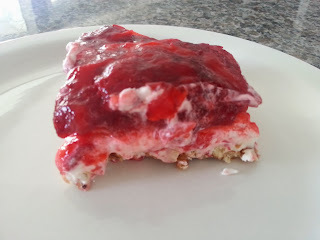 I think it is safe to say I have a "thing" for strawberry pretzel salad. I could probably eat it every day of my life and be rather happy. There are a few different variations of this recipe out there. Recently when I was craving this yummy treat a good friend of mine brought me a slice. This was the recipe she used. The strawberries and strawberry jello can be substituted for raspberries which is also delicious. Enjoy! Strawberry Pretzel Salad Ingredients 2 cups crushed pretzels 3/4 cup melted butter 3 tablespoons sugar, plus 3/4 cup sugar 1 (8 ounce) packages cream cheese 1 (8 ounce) containers whipped topping 2 (3 ounce) packages strawberry gelatin 2 cups boiling water 2 (10 ounce) packages frozen strawberries 1 (8 ounce) cans crushed pineapple whipped topping or whipped cream, to garnish Directions Directions Preheat oven to 400°. For the crust, mix the pretzels, butter, and 3 tablespoons of sugar. Press this mixture into a 9 by 13-inch pan and bake for 7 minutes. Set aside and allow to cool completely. In a mixing bowl, beat together the cream cheese and 3/4 cup of sugar. Fold in the whipped topping, and spread over the cooled crust. Refrigerate until well chilled. In a small bowl, dissolve the gelatin in the boiling water, and allow to cool slightly. Add the strawberries and pineapple, and pour over the cream cheese mixture. Refrigerate until serving time. To serve, cut slices and serve with a dollop of whipped topping. 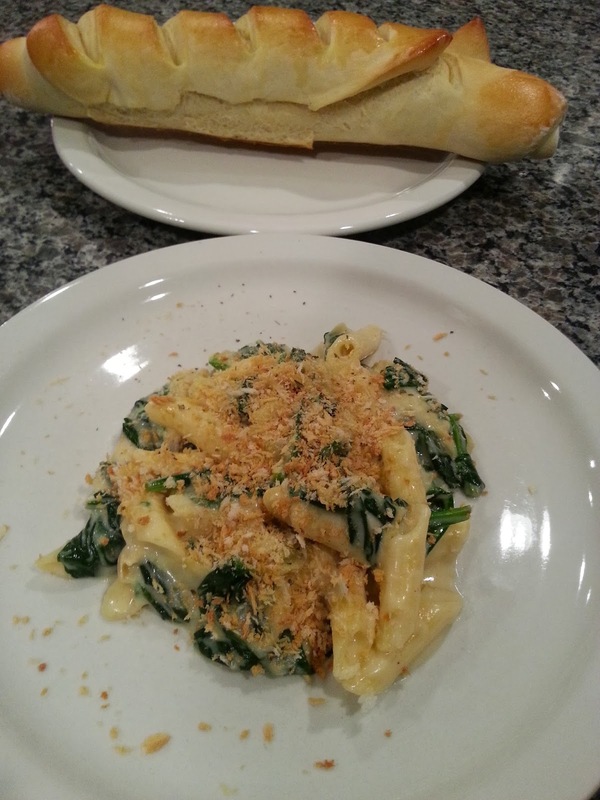 Spinach Artichoke Pasta...get outta town!! Ingredients 6 Tablespoons Butter 4 cloves Garlic, Finely Minced 2 bags Baby Spinach 2 cans Artichoke Hearts, Drained And Halved 3 Tablespoons Flour 3 cups Whole Milk ¼ teaspoons Cayenne Pepper Salt And Pepper, to taste ½ cups Grated Parmesan Cheese 1-½ cup Mozzarella Or Monterey Jack Cheese, Grated ½ cups Low Sodium Chicken Broth (less Or More) 12 ounces, weight Penne, Cooked Until Al Dente- I used gluten free pasta ½ cups Seasoned Panko Breadcrumbs- see note below Crushed Red Pepper, To Taste Preparation Instructions Melt 2 tablespoons butter in a large pot or skillet. Add garlic and throw in the spinach. Stir it around until it’s wilted, about 1 minute. Remove spinach from heat and set aside. Add 2 tablespoons butter to the same pot and raise the heat to high. Throw in the halved artichokes and stir it around until they get a little color, 1 to 2 minutes. Remove the artichokes from the pot and set them aside. Reduce the heat to low. Add 2 tablespoons butter to the pot. When melted, sprinkle in flour and whisk until it’s combined. Pour in milk and whisk to combine. Let it cook for 3 to 4 minutes, or until starting to thicken. Add Parmesan, Mozzarella/Monterey Jack, salt and pepper, and cayenne pepper. Stir to melt, and if it’s overly thick, splash in chicken broth. Add artichokes and pasta, tossing gently to combine. Gently fold in spinach, then pour the pasta into a serving bowl. Sprinkle the top with crushed red pepper flakes and plenty of Panko breadcrumbs for crunch. Note- I had some panko breadcrumbs but they were not seasoned or toasted. So I threw some on a cookie sheet, sprinkled them with Italian seasoning and then baked them at 350 until they were golden brown and extra crunch. This maybe took 10 minutes or so. But if you do this, keep you eye on the breadcrumbs so as not to burn them. Oh how I love thee, raspberry scones. What's not to love?! Soft, flakey, sweet, fruity goodness. I've made these are couple of times now and they never seem to last long. In fact the last time I made them they went so quickly I didn't even get a picture of them ;) I've mentioned before that I absolutely love America's Test Kitchen. I love to peruse their cookbooks and love to watch the show on Saturday mornings on PBS. Watching the show and reading the cookbooks inspires me to create delicious food in the kitchen for my family and the ones I love. I really don't need much more than that to feel happy and satisfied. The way to my heart...is certainly through food!! Raspberry Scones From America's Test Kitchen Makes 8 larger scones Ingredients: 8 TBS unsalted butter, frozen 1 1/2 cups frozen blueberries 1/2 cup milk 1/2 cup sour cream 2 cups all-purpose flour 1/2 cup sugar 2 tsp baking powder 1 tsp fresh lemon zest 1/2 tsp salt 1/4 tsp baking soda Directions: Preheat oven to 425 F. Line a baking sheet with a silicone baking mat or parchment paper. Grate the butter and set aside in the freezer. In a small bowl, whisk the milk and sour cream together. Refrigerate until needed. In a large bowl, whisk the flour, sugar, baking powder, lemon zest, salt, and baking soda. Add the frozen, gated butter and mix until butter is coated with flour mixture. Fold in the cold milk/sour cream mixture until just until combined. Turn the dough and any floury bits on a well floured counter-top. Flour your hands and the dough and gently knead 6-8 times. The dough will be quite sticky and should just barely form a raggedy ball. Roll dough out in a 12 inch(or so) square, using additional flour to prevent sticking if needed. Fold the top and chill the dough in the freezer for about 5 minutes. Roll the chilled dough onto a well floured countered top and form into a 12 inch square. Sprinkle the frozen blueberries evenly over the whole surface. Fold the sides of the dough to form a 4 inch square. Loosen the dough with a bench scraper. Roll the dough in a log. Turn the seam side down and press down on the log to form a 12x4 inch rectangle. With a floured knife, cut the dough in 4 small rectangles. Cut each rectangle into 4 triangles. Place the scones on the prepared baking sheet. Brush with melted butter and sprinkle with sugar, if desired. Bake for 18-25 minutes or until light golden brown. Cool 10 minutes before serving. Note: I use the Heath brand of chocolate covered toffee bits. If you can't find chocolate covered, chop up regular-sized Heath bars. Make sure the cream cheese is at room temperature, otherwise, the topping may be prone to little lumps of cream cheese. 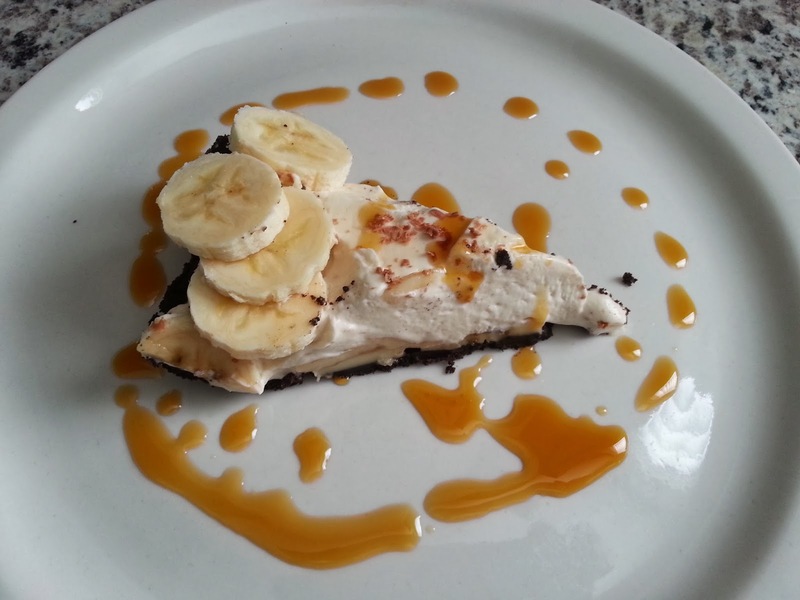 Also, it's really important to have a healthy layer of bananas otherwise the pie is too sweet. If your bananas are small and two won't cut it, don't be afraid - add a third. Ingredients Crust: 24 chocolate sandwich cookies (like Oreos or Trader Joe's Joe-Joe's) 5 tablespoons butter, softened Pie: 20 ounces dulce de leche (1 1/2 cans) or make your own 2 bananas 1 cup chocolate covered toffee bits 1 cup heavy whipping cream 1/4 cup powdered sugar 8 ounces light or regular cream cheese, softened to room temperature 1/4 cup brown sugar Directions 1.Add the cookies and butter to a blender or food processor and process until well combined. Press the mixture into the bottom and up the sides of a 9-inch pie plate. Refrigerate or freeze until set (this makes it easier to spread the dulce de leche over the crust). Spread the dulce de leche over the bottom and up the sides of the chilled crust. 2.In a medium bowl, combine the powdered sugar, brown sugar and cream cheese. Whip with a handheld or electric stand mixer until smooth and fluffy. Add the heavy whipping cream and starting at the lowest speed (to avoid splatters), mix until combined. Increase the mixer speed to medium and mix until the mixture is light and creamy and is the consistency of spreadable, thick frosting. 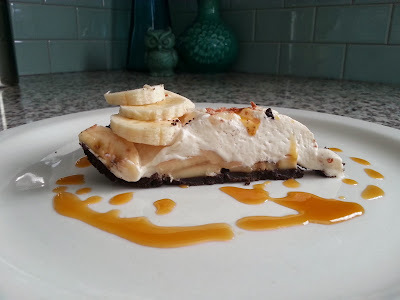 3.Slice the bananas about 1/4-inch thick and layer the slices over the dulce de leche in the crust. Sprinkle about 1/2 cup toffee bits over the bananas. Spread the whipped cream filling over the bananas and toffee, making sure to spread all the way to the edges of the pie, covering the bananas completely so they don't brown. Sprinkle the top of the pie with the remaining toffee bits. Chill for 1-2 hours before serving and up to 8 hours (longer than that and the bananas may get a little brown and mushy). What's not to love about chicken pillows. 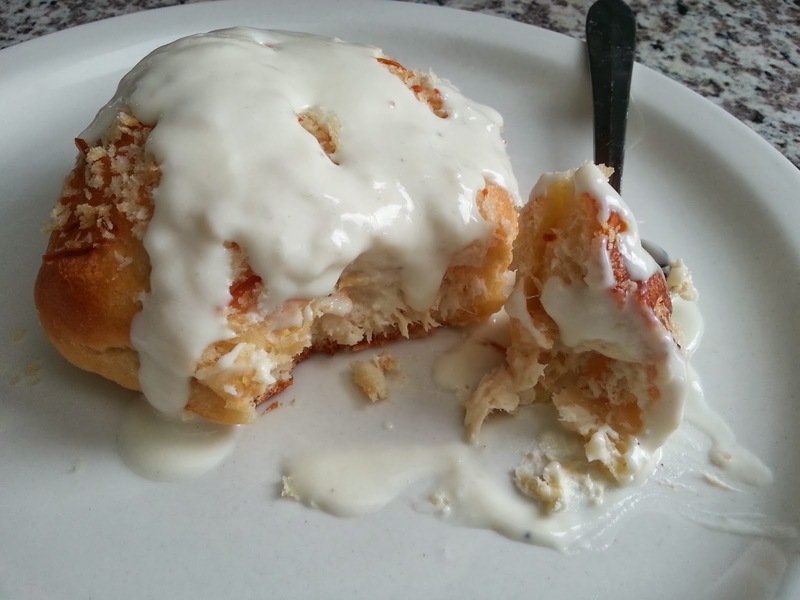 Tender shredded chicken, cream cheese, soft pillowy, butter rolls topped with a creamy gravy. I have never met one that I haven't enjoyed. 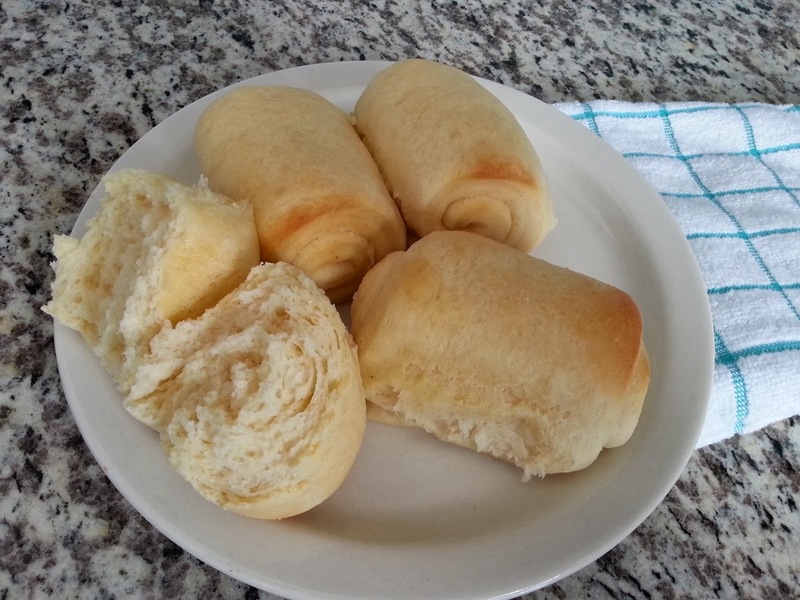 However, taking a little extra time to make my own rolls rather than using the Pillsbury canned crescent rolls and making the creamy gravy from scratch without harming a can of cream of anything soup took this delicious meal to the next level for me. The rolls were flavorful and more substantial than the usual thinner crescent kind. The gravy...Ooooh the gravy. Well you will just have to try it for yourself. I have really been trying for a couple of years now to stay away from condensed soups of any kind. They are full of preservatives and other junk and I...well I just try to avoid them where and when possible. I was thrilled when Mel from Melskitchencafe posted this recipe. Though, I didn't use her roll recipe for this recipe, her idea was genius. I feel like chicken pillows is a recipe that takes a little more work anyway. So I figure, if I'm going to take the time to make them, why not take the time to really make them. I took these to a friend and her family for dinner last night and then had my brother and his wife over for dinner also. I think my brother had 4, maybe 5 pillows. Needless to say, everyone loved these and I was happy I took the extra time. Delicious Chicken Pillows with Creamy Parmesan Sauce For the rolls: Note- I found that using this roll recipe along with the chicken I could get about 20 chicken pillows total. 1/2 cup milk (I use Vitamin D or full fat milk) 1/2 cup buttermilk 1/3 cup sugar 1 tbsp yeast 1/3 cup oil 2 eggs beaten 3 1/2 cups flour 2/3 tsp salt Put milk and buttermilk into a glass measuring cup and microwave approximately 35 seconds. Add sugar and yeast to milks and stir until sugar is somewhat dissolved. Put that mixture into bread maker. Then add all other ingredients into bread maker and hit dough cycle. This can also be done without the breadmaker in a kitchenaid or other standard mixer. If not using a bread machine, you just need to let your dough rise for about 45-1 hour after your dough is complete. For the chicken: 4 large boneless, skinless chicken breasts (about 2 1/2 – 3 pounds) 2 packages (8 ounces each) cream cheese, light or regular, softened to room temperature 1 teaspoon garlic powder 1 teaspoon salt I like to put my chicken breasts in the crockpot with a little chicken or vegetable broth and some seasoning and cook it on low for about 6 hours. Once cooked and cooled I then shred it. When the chicken is cooked and cooled slightly, shred or cut into small pieces. In a medium bowl combine the chicken, cream cheese, garlic powder and salt and mix until well combined. Set aside or refrigerate until ready to use. Rolls and coatingb> 1 batch buttery crescent rolls 1/2 cup (1 stick) butter, melted 2 cups panko bread crumbs 1/2 cup freshly grated Parmesan cheese Once the cycle is done I rolled out my dough into the biggest rectangle I could get. I added a little bit of flour to the dough so that it wasn't too sticky. Once I had my rectangle I just kind of eyeballed how many smalled rectangles I could get out of my large rectangle and using my pizza cuter cut my large rectangle into about 20 smaller ones. I then took each smaller rectangle one by one and filled it with the chicken mixture (approx. 1/4 cup of chicken mixture per roll), rolled it up, pinched the seams and set it aside. When all the chicken pillows have been formed, combine the panko crumbs and Parmesan cheese in a bowl or flat dish (like a pie plate). One by one, dip each chicken pillow in the melted butter and roll in the panko/Parmesan mixture. Place seam side down about 2 inches apart on baking trays lined with parchment paper, a silpat liner or lightly greased. Cream sauce/gravy: 3 tablespoons butter 3 tablespoons flour 1 chicken bouillon cube or 1 teaspoon chicken bouillon granules 1/2 teaspoon salt 1/4 teaspoon black pepper 1 1/2 cups milk 3/4 cup freshly grated Parmesan cheese 1 cup sour cream, light or regular In a medium saucepan, melt the butter. Whisk in the flour, cooking over medium heat for 1-2 minutes, stirring constantly, until the mixture is golden and bubbly. Slowly whisk in the milk, stirring in the chicken bouillon, salt and pepper once the milk has been completely added. Stir constantly over medium heat until the sauce thickens and bubbles, about 5-10 minutes, taking care to adjust the heat accordingly so the sauce doesn’t burn on the bottom. Stir in the Parmesan cheese and cook, stirring, until the cheese is melted. Remove the sauce from the heat and stir in the sour cream. Thin the sauce with a little milk if needed. I served our chicken pillows with a little mashed carrot and parsnip, rice pilaf and corn. It was a delicious meal and one I am sure I will make again...soon! Pumpkin Chocolate Chip Cookies. Hmmmm just hearing those lovely little words makes me salivate. These are simply awesome! 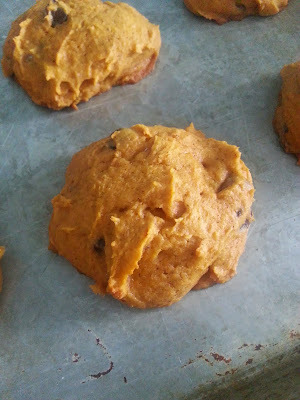 Warm out of the oven, they literally melt in your mouth and then once cooled, they are soft, pillowy deliciousness in a yummy little package. I love them...can you tell? 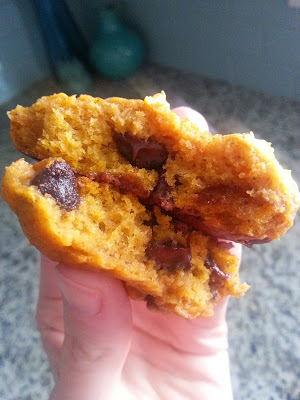 Pumpkin and chocolate are just a match made in heaven. 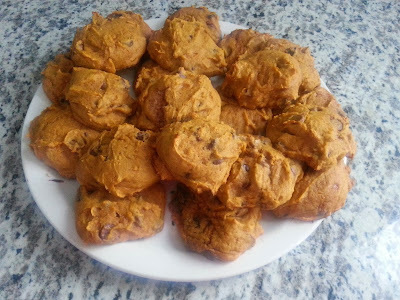 I had some pumpkin in the fridge that needed to be used and was bored so thought I'd whip up a batch of these beauties. 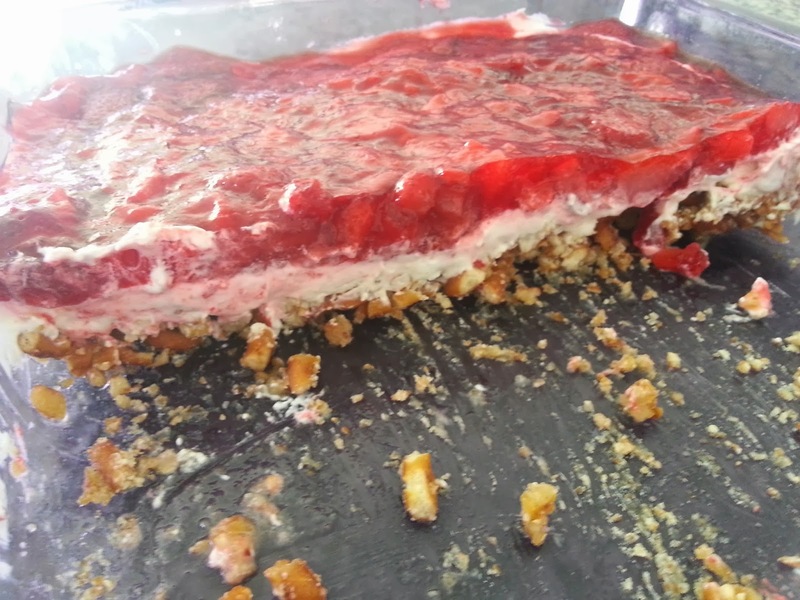 Gabe had a couple of friends over and I knew I had a friend stopping over later in the day to bring me some raspberry pretzel salad I had been craving so I wanted to have something to feed the boys and to give to my friend when she came by. Gabe and his friends devoured a few, I may or may not have eaten 6 or so for lunch and then once the hubby got home from work we polished them off in a jiffy. It was a good day ;) Pumpkin Chocolate Chip Cookies Modified from a recipe by - George Duran (Food Network) Ingredients 1 cup (2 sticks) unsalted butter, softened 1 cup white sugar 1 cup light brown sugar 2 large eggs 1 teaspoon vanilla extract 2 cups canned pumpkin puree (One big can- original recipe called for 1 cup) 3 cups plus 2 tablespoons of all-purpose flour 2 teaspoons baking soda 1/2 teaspoon salt 1 teaspoon ground cinnamon 1/2 teaspoon ground ginger 1/4 teaspoon ground nutmeg 1/4 teaspoon ground cloves 2 cups (12-ounce bag) milk chocolate chips, not semisweet Nonstick cooking spray or parchment paper Directions Heat the oven to 350 degrees F. Spray cookie sheets with nonstick spray or line them with parchment paper. Using a mixer beat the butter until smooth. Beat in the white and brown sugars, a little at a time, until the mixture is light and fluffy. Beat in the eggs 1 at a time, then mix in the vanilla and pumpkin puree. In a large bowl, whisk together the flour, baking soda, salt, cinnamon, ginger, nutmeg, and cloves. Slowly beat the flour mixture into the batter in thirds. Stir in the chips. Scoop the cookie dough by heaping tablespoons onto the prepared cookie sheets and bake for 14 minutes, or until the cookies are browned around the edges. Remove the cookie sheets from the oven and let them rest for 2 minutes. Take the cookies off with a spatula and cool them on wire racks. 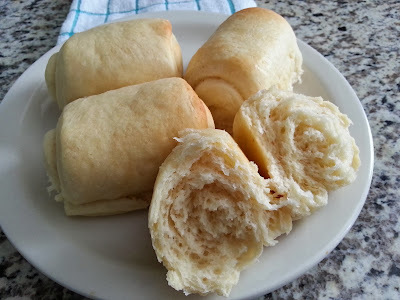 I have a wonderful recipe for homemade buttermilk rolls that I got from my sister in law a few years ago. They are my go to. Unless my yeast is bad, they have never failed me and they never seem to disappoint. However, lately I've felt myself needing something different. I guess you could say I've become a little bored with my old recipe and so I thought I'd try my hand at something new. I saw this recipe and was intrigued by the use of cornmeal. I thought why not? It doesn't hurt to have a couple of favorite roll recipes right?! Besides if Mel says they are good, then they have to be good. These were really delicious. The corn gave these soft, tender, buttery rolls a slightly different texture and sweetness than my buttermilk roll recipe. They were easy enough to make and I really enjoyed them. I think I'll definitely make them again and I am happy to add them to my list of favorite rolls. Buttery Cornmeal Crescent Rolls Yield: Makes 2 dozen rolls Note: if you need/want to use active dry yeast instead of instant yeast(which is what I did), change the amount of yeast to 2 tablespoons active dry and dissolve the yeast in 1/2 cup warm water and 1 tablespoon sugar. Let the yeast mixture activate and foam (approximately 5 minutes) before adding it to the cornmeal mixture with the butter and 1/3 cup sugar. Also, as with all yeast doughs, I never use the flour amount called for in the recipe as a hard fast rule (unless a weight measure is given and then I pull out my kitchen scale). Because humidity, temperature, altitude and a multitude of other factors can impact how much flour you need in your yeast doughs, I always judge when to quit adding flour by the texture and look and feel of the dough rather than how much flour I’ve added compared to the recipe. This tutorial on yeast may help identify how a perfectly floured dough should be. 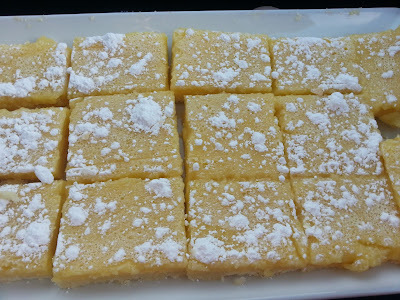 Ingredients 2 cups milk 2/3 cup yellow corn meal - I actually used white cornmeal. I honestly didn't notice I had bought white until I got home from the store. 1 ½ tablespoons instant yeast ½ cup (1 stick) butter 1/3 cup granulated sugar 1 teaspoon salt 3 large eggs 5 ½ – 6 cups flour Directions 1.Heat the milk to just below a boil so bubbles are just appearing around the edges (this is called scalding milk). Add the cornmeal and cook and stir until thickened, lowering the temperature if needed so the mixture doesn’t boil (see picture below the recipe for an idea of what the consistency should be). Pour the cornmeal/milk mixture into the bowl of a stand mixer or a large bowl and let cool until lukewarm. Add the yeast, butter and sugar (if you dissolved active dry yeast with a bit of water and sugar until it foamed, add it now). Mix. Add the salt and eggs. Mix well. Add the flour gradually until a soft dough forms. Knead for 5-8 minutes. 2.Transfer the dough to a lightly greased bowl covered with lightly greased plastic wrap and let rise until doubled. 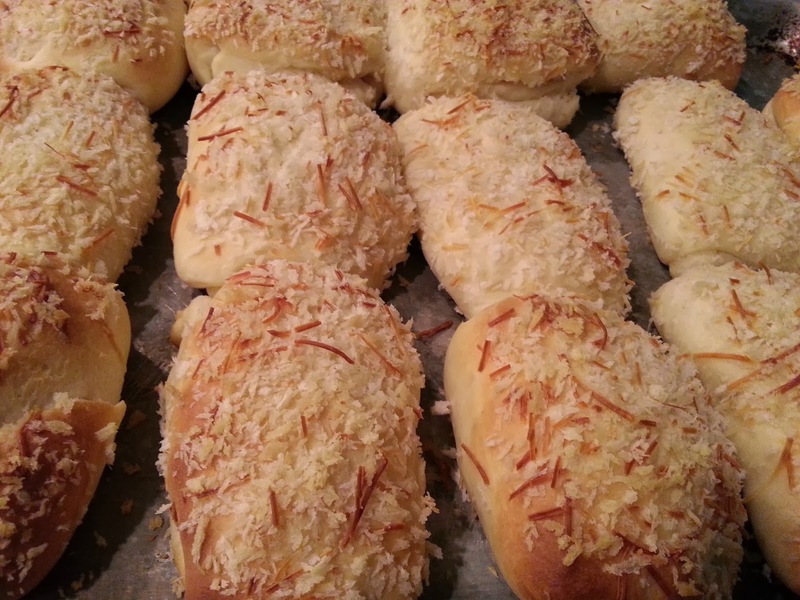 3.Divide the dough into three portions and roll each into about an 8-10 inch circle. Brush the top lightly with butter. Cut into 8 wedges and roll each wedge up starting from the wide end so it forms a crescent roll shape. Place each roll on a lightly greased or silpat- or parchment-lined baking sheet, spacing about 1-2 inches apart to allow for rising. Cover lightly with greased plastic wrap. Let the rolls rise until doubled. 4.Bake at 350 degrees for 10-12 minutes, until lightly browned. Brush with butter while still warm. 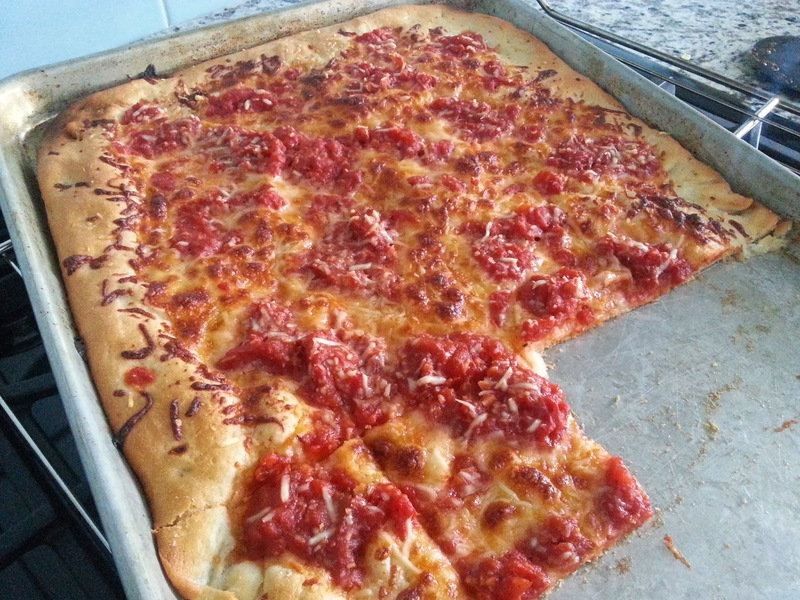 A couple of Saturday's ago, while I was sitting watching my fave cooking show 'America's Test Kitchen' they made this pizza. 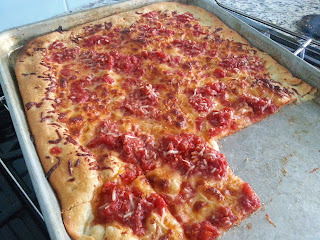 They called it 'Grandma's Pizza'... I missed why. Regardless of the name, it looked relatively easy and I was hungry so I set off into my kitchen to give it a go. I loved loved loved this pizza. Brad (who is a dominos only kind of guy) also said that he thought it was really good. This coming from someone who doesn't like thin crust and who's favorite kind of pizza is Hawaiian (he really doesn't deviate much from this truth) really surprised me. Needless to say, I will definitely be making this again soon. I have been thinking about it every since. This recipe calls for bread flour. I didn't have any on hand so I used regular white flour. While I was still happy with my results, next time I think I'll definitely try the bread flour to see if I can't get a slightly chewier dough as mentioned by the experts at American's Test Kitchen. sorry about the poor quality of the image. I took this with my phone. Serves 4 If the dough snaps back when you press it to the corners of the baking sheet, cover it, let it rest for 10 minutes, and try again. Ingredients Dough 3 tablespoons olive oil 3/4 cup water 1 1/2 cups (8 1/4 ounces) bread flour - I used regular white flour) 2 1/4 teaspoons instant or rapid-rise yeast 1 teaspoon sugar 3/4 teaspoon salt Topping 1 (28-ounce) can diced tomatoes 1 tablespoon olive oil 2 garlic cloves, minced 1 teaspoon dried oregano 1/4 teaspoon salt 8 ounces mozzarella cheese, shredded (2 cups) 1/4 cup grated Parmesan cheese 2 tablespoons chopped fresh basil Instructions 1. FOR THE DOUGH: Coat rimmed baking sheet with 2 tablespoons oil. Combine water and remaining 1 tablespoon oil in 1-cup liquid measuring cup. Using stand mixer fitted with dough hook, mix flour, yeast, sugar, and salt on low speed until combined. With mixer running, slowly add water mixture and mix until dough comes together, about 1 minute. Increase speed to medium-low and mix until dough is smooth and comes away from sides of bowl, about 10 minutes. 2. Transfer dough to greased baking sheet and turn to coat. Stretch dough to 10 by 6-inch rectangle. Cover with plastic wrap and let rise in warm place until doubled in size, 1 to 1½ hours. Stretch dough to corners of pan, cover loosely with plastic, and let rise in warm place until slightly puffed, about 45 minutes. Meanwhile, adjust oven rack to lowest position and heat oven to 500 degrees. 3. FOR THE TOPPING: Place tomatoes in colander and drain well. Combine drained tomatoes, oil, garlic, oregano, and salt in bowl. Combine mozzarella and Parmesan in second bowl. 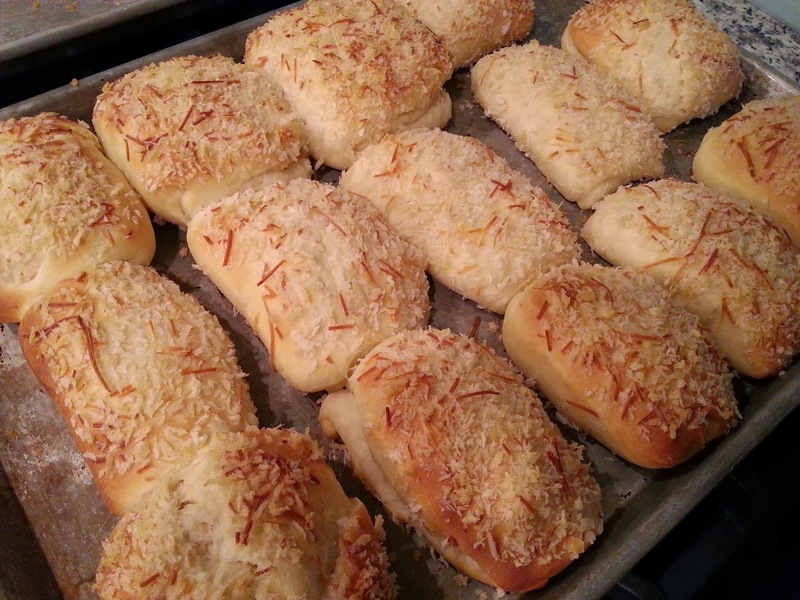 Sprinkle cheese mixture over dough, leaving ½-inch border around edges. Top with tomato mixture and bake until well browned and bubbling, about 15 minutes. Slide pizza onto wire rack, sprinkle with basil, and let cool for 5 minutes. Serve. NOTE- Pic is not mine. Credit to Ourbestbites.com I made this dip for our family Christmas eve get together. 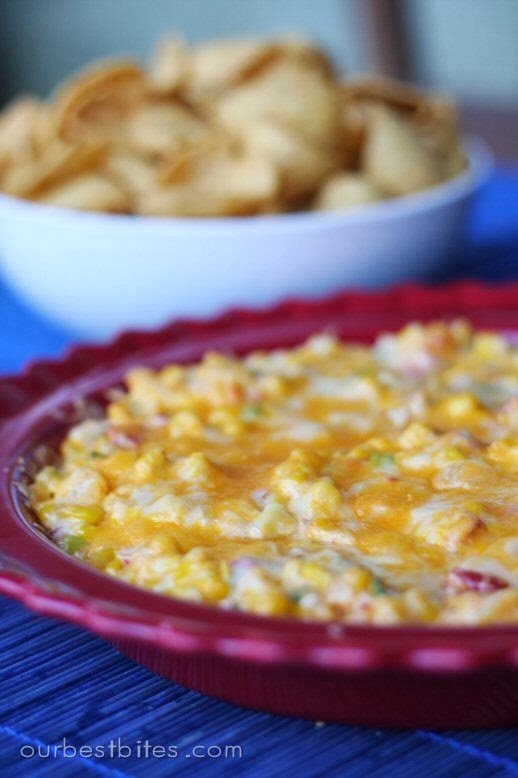 I was in the mood for dip and for some reason corn sounded good so I started perusing Pinterest and found this little lovely. It didn't take too much time to prepare, I had the majority of the ingredients on hand and well it just looked and sounded like something I wanted to eat. It did not disappoint. It was creamy and delicious. It wasn't too heavy and wasn't greasy at all. I am definitely going to be making this again. Only problem with this dip is you want to either take it with you somewhere or have allot of people over to help you eat it otherwise it would be easy to sit and devour the whole thing alone!! I have a BIG weakness for dip!! Enjoy =) Ingredients •2 Tbs butter •3 1/2 cups corn kernels (I used WF sweet white corn) •1/2 tsp salt •1/8 tsp freshly ground black pepper •1 cup finely chopped yellow onions •1/2 cup finely chopped red bell peppers •1/4 cup chopped green onions (green and white parts) •1 jalapeno, seeded and minced- (I omitted this) •2 tsp minced garlic •1/2 to 1 cup mayonnaise - 1/2 C was plenty for mine •4 ounces Monterey jack shredded •4 ounces sharp cheddar, shredded •1/4 tsp cayenne (I omitted this) •Tortilla chips or a sliced baguette, for dipping directions •1-Preheat the oven to 350°. •2-Melt 1 Tbs of the butter in a large heavy skillet over medium-high heat. Add the corn, salt, and black pepper. Cook, stirring occasionally, until the kernels turn deep golden brown, about 5 minutes. Note that if you’re using frozen corn it probably won’t get golden brown. Just cook for about 5 minutes as the recipe states. Transfer to a bowl. •3-Melt the remaining tablespoon of butter in the skillet. Add the onions and bell peppers and cook, stirring often, until the onions are wilted, about 2 minutes. Add the green onions, jalapeno, and garlic and cook, stirring, for 2 minutes, or until the vegetables are softened. Transfer to the bowl with the corn. •4-Add 1/2 C mayo, cayenne pepper, half of the Monterey jack and half of the cheddar and mix well. If you need more mayo to hold the mixture together then add it, but I found that 1/2 C was plenty, and I even added a little extra cheese. •5-Pour into an 8-inch square baking dish, or something equivalent and sprinkle the remaining cheese on top. Bake until bubbly and golden brown, 10 to 12 minutes. Serve hot with tortilla chips or Fritos or sliced baguette. So many of the recipes I post come from Mel over at melskitchencafe.blogspot.com. I love her food, her writing and I have never had a recipe that she has posted fail me. This one is no different. Our family was invited to a little get together on Monday night to meet some of the new neighbors in the neighborhood where we are building our new house. I wanted to contribute something to the evening...I never really feel comfortable arriving at the home of someone kind enough to have us over empty handed. I saw this recipe on Mel's page and thought they looked pretty and summery. They did not disappoint. The crust is especially phenomenal. They were light, creamy, sweet but not sickly and we thoroughly enjoyed one...ok maybe three of them. Don't mind the pics. I literally took them in the car on the way to our get together. 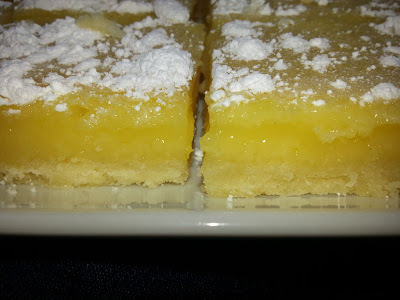 Lemon Bars INGREDIENTS For the Crust: 1 3/4 cups all-purpose flour 2/3 cup powdered sugar, plus extra to sprinkle on bars 1/4 cup cornstarch 1/2 teaspoon salt 12 tablespoons butter (1 1/2 sticks), at cool room temperature, cut into 1-inch pieces For the Filling: 4 large eggs 1 1/3 cups granulated sugar 3 tablespoons all-purpose flour 2 teaspoons grated lemon zest, from 2 large lemons 2/3 cup freshly squeezed lemon juice, from 3 to 4 large lemons 1/3 cup milk Pinch of salt (about 1/8 teaspoon) DIRECTIONS Place an oven rack in the middle position and preheat the oven to 350 degrees F. Line a 9X13-inch baking pan with foil or parchment paper and lightly grease the foil/parchment. Stir together the flour, powdered sugar, cornstarch, and salt (this can be done in a food processor or in a large bowl by hand). Add the pieces of butter and cut the butter into the dry ingredients using a pastry blender, two knives or your fingers (taking care not to melt the butter too much - you might try freezing the butter and grating it into the dry ingredients on the large holes of a box grater) or process in the food processor for 8 to 10 seconds and then as needed until the mixture resembles coarse meal. Sprinkle the mixture into the prepared pan and press into an even layer on the bottom and about 1/2-inch up the sides of the pan. Refrigerate for 15-30 minutes. Bake until golden brown, about 20 minutes. For the filling, whisk together the eggs, sugar, and flour in a medium bowl and then stir in the lemon zest, juice and milk to combine. Pour the filling onto the warm crust (it's important that the crust is still warm!) and reduce the oven temperature to 325 degrees. Bake for about 18-20 minutes until the filling feels slightly firm to the touch. 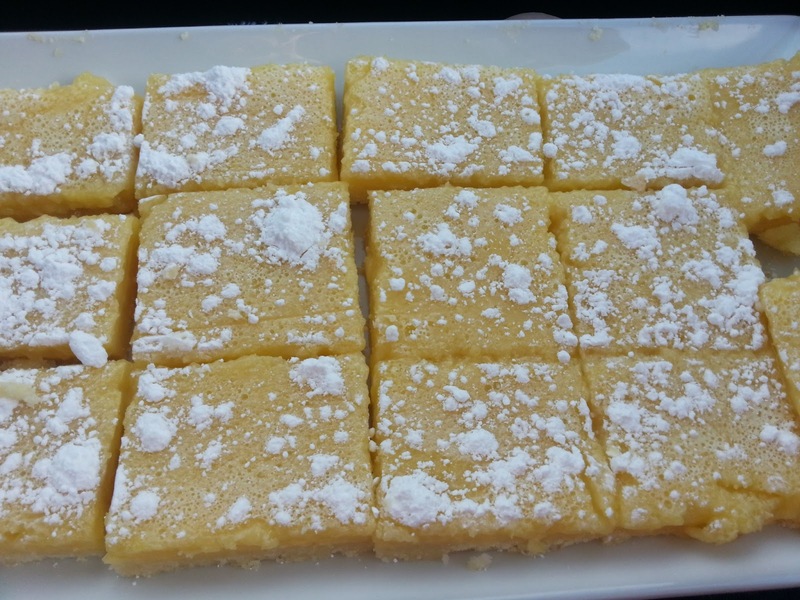 Cool the bars to room temperature, sprinkle with additional powdered sugar and cut into bars. The love of a family is life's greatest blessing. I am orginally from Melbourne, Australia and that is where I met my sweet husband Brad. Now I call America my home although a big part of my heart will always be in Oz! Brad and I were married on April 12th, 2003 in the Salt Lake Temple. 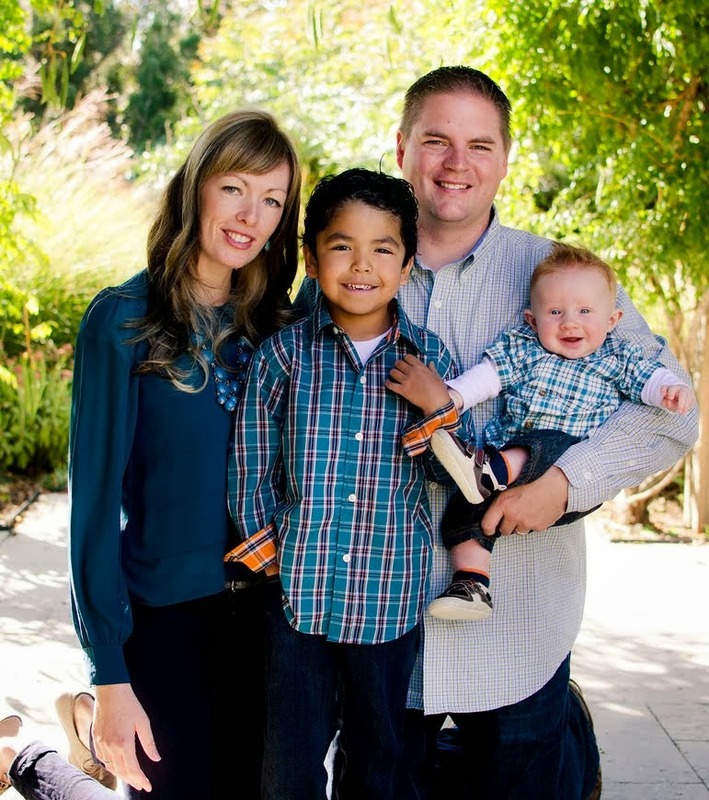 Through the miracle of adoption we have two sweet little boys. I LOVE to cook and bake and share the recipes I love with family and friends. Welcome to my blog. This is a place for me (the Mum) to keep and share my favorite recipes with you.